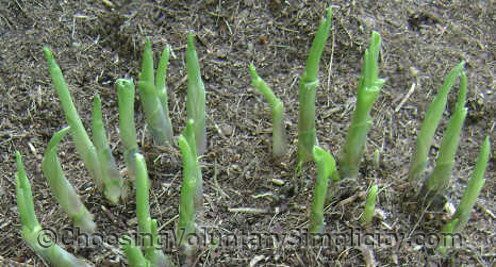 Home » Growing Hostas / Reader Questions » What Do Hostas Look Like When They First Come Up in the Spring? You should look for eyes (new shoots) poking out of the ground. Usually young or small hostas have only one or two eyes, so they may be somewhat more difficult to see, but if you feel around in the soil where you planted each hosta you will probably be able to feel the hard pointed tips of the new shoots even if they aren’t visible yet. It is also possible that you have some late emerging hostas… some hostas just normally take longer to show growth than others and will be just starting to show eyes when other hostas growing under the same conditions already have leaves. Some hostas have eyes that are skinny, other hostas have eyes that are thick and fat. The size and color of the eyes will also vary depending on the age and size of the hosta and where it is planted. The eyes might be green or purple, or even white if they have been covered by mulch or leaves. Be very careful not to injure the eyes because any injury will result in deformed leaves. I like to use my hands to gently clear away any debris from around my emerging hostas… and I have hundreds of hostas, so spring cleaning them is a major task and accidentally stepping on emerging eyes could be a major concern. I have found a solution that works well for me… I always wait until spring to remove the previous year’s debris because the dead hosta leaves mark the location of each hosta and are an indication of each hosta’s current size so I can see at a glance if a particular hosta needs more space. When I cut flower stalks I always cut them several inches above the soil, and every spring these dried stalks show me exactly where the eyes will emerge. Each fall hostas die completely down to the ground and yet each spring they come back bigger and with more eyes and leaves than they had the year before. Hostas are truly amazing plants. I’m Karlie and I want to thank you for the great response to my question. I never expected a special post just for me! After following your suggestions I did poke around in the dirt near where I had planted my 3 hostas and I found eyes for every single one. (2 eyes for 2 and 1 eye for the smaller one). I am so excited to see what they will look like for this year. I wish I would have found this sight a few years back when I was just starting out with hosta’s. I used to look for information and not find what I was looking for but you have answered everything here. I am amazed at your hosta photograph’s and information. Thank-you from a fellow hosta lover. Your last paragraph in this post is the thing that has always gotten me about hostas. They grow to a point during the summer and then they die back to the ground. Then the next summer they not only grow back as big as they were but they grow bigger! (Assuming they’re doing well.) Hostas are amazing plants and I never get tired of them. Your photos and information are wonderful and hopefully they’ll get new people interested in hostas too! Having said that. I still have some question. I noticed some roots on surface of soil. Decided to dig out the root. (zone 7) added bonemeal under roots and saw few 1″ small white worms in the soil around hostas root. I covered the small roots which were out of soil. Did not see or can not recognize any shoots yet. Should I be concern about the worms or not seeing any shoots yet? Flo, you are very welcome. I’m glad the pictures were helpful. I wouldn’t be concerned about not seeing any shoots yet because they can take a while to appear, depending on the weather and the type of hosta. I have some hostas that don’t show any shoots at all until after other hostas are fully leaved out. The worms… I don’t know. It depends on what they are and how many. I would wait a while and dig around the hostas to see if you have a lot of these in your soil. Good to know. I’ll be planting hostas in a new spot this year (many of my old ones were not in low enough traffic areas). I live in upstate NY. I planted several hostas last year but so far, I have not seen any evidence that they have come back. I saw the earlier post from someone else saying the same thing and she found the new shoots – I did not. Does this mean my hostas are dead? My day lilies are all up through the ground already. Rojo, I wouldn’t give up on the hostas yet. I have some hostas that come up at least a month later than others do. If it gets to be later in the spring and you don’t see any shoots, then yes, that would mean your hostas are dead… but it’s still early yet. thank you SO much! I’ll keep my eyes open for signs of hosta life. I LOVE the way they look in my front yard. I purchased them from a reputable garden center. 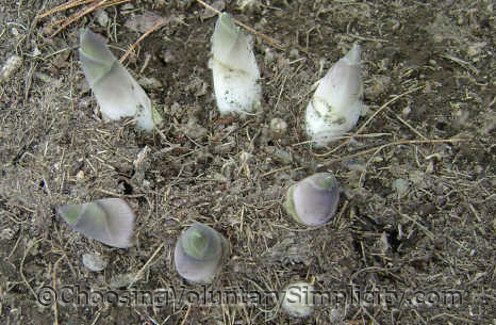 Hostas are edible, and when shoots reach the size of the ones in the second pictures, they’re really reminiscent of asparagus. We cut maybe a third of the shoots from any given plant to eat. They’re one of my husband’s favorite greens. I have never had the pleasure of observing a hosta break through the earth in the spring. Despite every trick known to mankind and several I am sure my mother picked up from some passing aliens I have never ever managed to eradicate the slugs and snails from our garden. I go out every evening, I collect them up and feed them to our chickens. But like some Old Testament family, they have begat several thousand offspring and said offspring celebrate Spring on my hostas….. Excellent answer above! 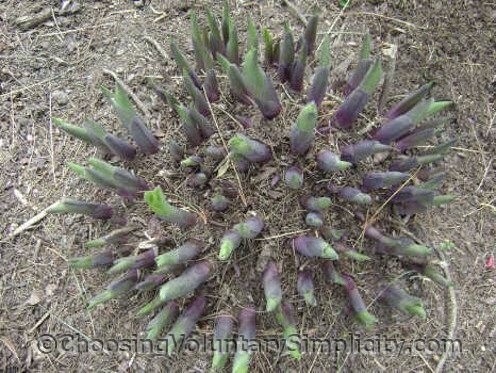 I would add to that Hosta will spike about 6 weeks after the last of the snow has melted; and will continue to spike for another 4 to 6 weeks after that depending on where you live. If spikes do not emerge by mid-season the plants might have been lost to Freeze Out and or Crown Rot. Late fall/early spring prevention for this includes covering your plants during spring thawing and freezing. Take the covering off after the ground has firmly frozen, and put it back on when the snow begins to recede BUT before it acceptably above freezing. Keeping the ground dryer in the late fall and early spring prevents freeze damage. Hosta will be acclimated to their growing location after about 2 years of this protective cycle.